I have so many things that I want to show you! I can happily tell you that I've had a wonderful week of receiving goodness in the mail from 3 different bloggie friends. Each of those parcels will receive a post of their own when I can get the photos into a digital format for sharing online. I've also some finished projects I want to share, such as the plaid quilt for my son. It turned out so well that I'm gearing up to make another (I still seem to have quite a stash of plaid shirt scraps that I can use)! You can bet I will be posting photos of the quilt as soon as possible. It was such a fun project to make. and make them into something useful, like this zippered pouch. However, now I'm not so sure I want to use this second piece of stitchery that way - or even if I like the fabrics I've put with it. Until I sort it out, this remains in my "works in progress" bin. I'd like to tell you that it's the only WIP in that bin. Ahem. 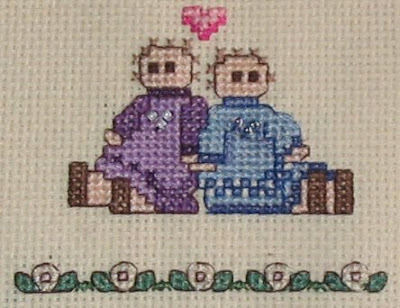 the best way to use this little cross stitch piece I made. I thought I would make it into a little accent pillow and began to sew fabric strips around it. This is as far as I got. I wondered if it would be better to frame it to hang on the wall instead of making it into a pillow? What do you think? (My camera woes haven't been resolved yet, so I'm resorting to using some photos I had on file:) Despite the rather freak snowfall we had here over the weekend, spring is here and it's blooming! These lovelies are cheering (my disgruntled spirits over the dying camera) with their sunny brightness. Until my camera self-heals (I'm still hoping...) or I can buy another, I'll just have to tell you what I've been working on. Remember the Manly Quilt? So far, I've completed the machine quilting and have cut the binding strips. My plan is to get the binding together and ready for the hand stitching step for this evening. My husband and I have been enjoying House M.D. on dvd from the library in the evenings, which means I've been spending time doing whatever hand work I have ready to go while we watch. I've already managed to get some knitting and needlepoint time in over the weekend, but tonite my sights are set on getting this quilt done. Recently, I was lucky to be one of the winners in the weekly giveaway called Free Fabric Fridays over at Sew, Mama, Sew! I chose this fabric from Sandi Henderson's Ginger Blossom collection. Please, go visit this blog for a chance to win some beautiful fabric (you get to choose), read some great tutorials (you can even enter your own tutorials to be included in their links), find pattern reviews and then don't forget: you can also shop for the latest and greatest fabrics in their online store. Enjoy! My apologies for seeming to disappear from blogging the past several days. I've been having some major camera troubles. I have projects and good stuff from friends to share with you... but I need my camera to be working properly (which it isn't - I actually think it is in its death throes and so I will be looking to buy a new digital camera or else go back to my SLR and have the film put to CD so I can upload them to the computer.) Anyways, until I get that all sorted out, do you want me to post anyways? I'm certain you'd rather see pictures than lots of boring text? It's rather crazy. I've been scooping up vintage patterns for little girls and I have two sons. I guess I'm drawn to the simplicity of the designs and can envision giving them a new twist by using modern fabrics. They also would look adorable made up in vintage fabrics, which is probably why I find them so hard to resist at the thrift stores. You may remember me introducing Miss Thrift (Penny) to you awhile back. 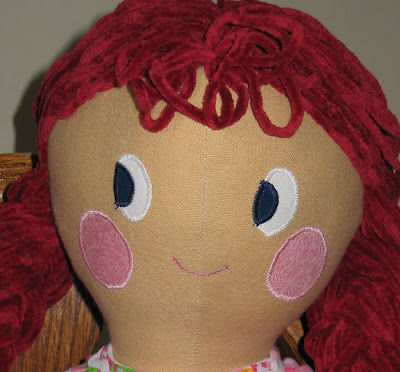 She is made from flannel and has soft chenille yarn for her hair. 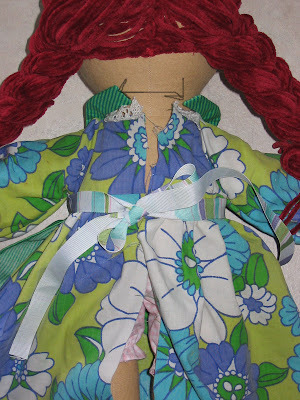 She is the first doll made from this particular pattern and was easy enough to make. I always seem to tweak patterns as I go along - as was the case with Penny. Once the doll is made, the real creative fun for me begins! Making her clothes. I always love this part. She looks good from the front, but there were some major issues to the back of this outfit. It didn't fit! I guess I make dolls too plump for their clothes? There was no way I was going to get the apron to fasten at the back of her neck (without strangling and disfiguring Penny - I know, because I tried!). Add in that the dress was also too tight to fasten without major wrestling and you can see the disappearance of the fun factor in clothes making. Phooey! Now tell me, does she look fat to you? I happened across some vintage Needlework magazines during my weekend thrifting. I love looking through these for entertainment, ideas and inspiration. The magazines are chocked full of patterns for various needlework projects. There's knitting, crocheting, sewing, macrame, needlepoint, embroidery and general crafting projects dispersed throughout the magazine. To be honest, some of the clothing styles are quite funny and rather surprising - such as the patterns for knitted bikinis and beachwear. The best surprise I've had yet happened as I flipped through the pages and discovered this picture of knitted toys ... I recognized the Mrs. Bunny toy! Someone had knitted this very toy for me. My bunny had been given to me when I was baby and shows the wear and tear of her many years of love. Apparently I carried her everywhere and most likely by her ears as she has been a one eared bunny for about as far back as I can remember. I don't remember my bunny wearing glasses or carrying a basket, but she still has her little dress. Now I'm going to have to dig her out of storage to have another look at her and ask my Mom if she can remember who made this toy for me. along with a stash of sewing notions. You can imagine my surprise at finding this like-new book in the 25cent section. I took it to the counter and asked the price. No, it was not 25 cents, it was actually $2. Still a good price but when the amounts were totalled the final tally was more cash than I had in my pocket (ahem, that was due to the fact that I had already shopped at two other thrift stores first and had already spent more than half of my allotted $15 for the days' worth of thrifting). I offerred to give less money than the amount asked for, explaining that it was all the cash I had on me. She said, "No". I said, "Keep the book then". She sighed, shrugged, then shoved the book across the counter to be put into my shopping bag along with my sewing purchases. Oh, how I love that thrift store! A book that I thought was 25cents went up to $2 and then ended up being free. Any questions as to why I love thrift store shopping? while I continue to search for a vintage blue piece. Recent results? I did land this vintage beauty which may not be the colour I want for this project... but it will do quite nicely for the vintage pink quilt I want to make (but not until that colour collection grows a wee bit more). I must thrift more often. ;o) Guess what I want to do on Sat.? It's probably obvious to those who know me that I love projects made from fabric scraps. Remember this quilt made from scraps? Funny thing is, I still had some pieces left over after making it. I made a pillow cover with some of those scraps and still had pieces left. The remaining bits were made into these blocks. I've had several ideas of what to make with them. Coasters. Sachets. A doll quilt. Perhaps another pillow cover. Hmmmm. Not sure yet what they will become. I am just enjoying their scrappy goodness at this point until the "great idea" strikes. Scrap work is addictive for me (in a good way, I think ;o). A. I have to find 5 blogs to nominate, which haven't had this particular award before. B. Each of the 5 blogs must have a purpose. C. The nominated blogs must make a link back to this page. D. The logo must be put on their blog and it must link back to this blog. Choosing just 5 blogs to nominate is the tough part for me. I have so many blogs that I love to visit - each one is meaningful and enjoyable to me for different reasons. 1. My 3 girlfriends (Heather, Nicola & Samantha) at FourFriendsandaBlog. You inspire me. You encourage me and you amaze me! You not only talk about living green, eating healthy and the pleasures of family life and homeschooling - you girls live it! You do know how to make life fun. 2. Amandajean at Crazy Mom Quilts. Your quilting prowess is revered throughout blogland. You share your amazing talent with gorgeous photos and wonderful tutorials. So much eye candy and inspiration. 4. Felicia at Fluffy Flowers. You have a gift for making whimsical creatures and a way with words that make me smile. You also have broadened my knowledge of the South and made me swoon with the gorgeous photos of flora and (oh, my!) the shots of old fashioned shops filled with vintage treasures. 5. Sonya at Knit Sonya. You constantly amaze with your creative talents (your knitting prowess in particular has me in awe) and eloquence. You post beautiful photos and moving words. Now, ladies it's up to you to continue to hand out this award in blogland. You know, I think I could cite 5 more blogs each day because there is something special about each one I visit. Your blogging is with a purpose, and I want to thank you.